Today’s workplace landscape is a fast-paced, competitive environment, and employees are seeking a new kind of career development. Why is this? Companies can’t remain passive about their employee development programs because the cost of losing talent is high. On average, every lost employee costs about six to nine months of that employees’ salary to replace. And that doesn’t count the indirect costs of lost productivity5. In this article, we will explore how forward-thinking companies are modernizing their engagement and retention tactics to provide employees with what they want – an increased focus on employee development programs. For today’s workforce, career development is about moving forward and not just in terms of getting promoted. Most organizations are moving towards flatter hierarchical structures with fewer middle managers which leads to fewer promotional opportunities. So how can you ensure employees are satisfied and encourage them to grow in a way that aligns to personal and company goals? An alternative concept to the traditional career ladder, the career lattice is also known as the rock wall. This new terminology captures the idea that careers aren’t just upward, linear climbs. Instead, there are sideways moves in addition to upwards movement, and success should be rewarded even if those moves aren’t in ascending directions. It’s a mutually beneficial situation: your company will benefit from employees with broad organizational knowledge and those employees will gain opportunities to explore other paths that increase their skillsets. But career lattices don’t often happen spontaneously. Both employees and managers need to understand that gaining additional skills, expanding cross-functional knowledge, and participating in lateral moves are all important building blocks for the future – and they need a little help implementing it as part of an employee development program. Formal career development programs are gaining popularity in part because they help employees acquire the knowledge, skills, and career goals they seek. But they’re also popular because they encourage learning through others, which benefits multiple employees throughout your organization, facilitates knowledge transfer across all levels and requires less human resources administration time. that allow employees to help themselves. But what should an employee development program look like? Human resources personnel only have so much time and so many resources to put programs into place. These development programs should be self-directed and allow employees to help themselves to develop their careers. Why? You’ve heard the adage, “You can lead a horse to water but you can’t make it drink.” Along the same vein, employees should drive their own careers through the employee development opportunities human resources provide. However, take note: this doesn’t mean it’s fine to put programs in place, sit back, and watch them run. Employees just won’t be as likely to take part if they don’t see excitement throughout the company about them. Shift the organizational culture to one that values employees’ experience and contributions so advancement is more than just moving up the company ladder. Ultimately, the key to all of these program examples is helping people gain true insight into career advice as part of executing their career plans. When it comes to career development, it’s true that employees should be self-directed and drive the process – but they still want guidance from other people in mapping out their careers and deciding upon career paths should be. By combining employee development programs such as mentoring, buddy systems, and coaching with an employee career plan, you can provide employees with what they want while driving significant business results for your company. But what does an effective employee career plan look like? Read on to find out. Your top-performing employees know they’re top-performing. And they’re aware they could easily get jobs elsewhere. So what can you do to persuade them they want to stay? The tour of duty should include details of what resources employees will need to create an impact and continue their own development as they fulfill specific goals for the company. A key part of making this work is by connecting employees to the right people, which often happens through employee development programs. After all, the only way people are going to create strong career plans is by connecting people to those careers. In addition, while creating these career plans it’s important to ensure managers include measurable outcomes to determine the financial impact of the program. For example, you can track whether employees participating in career development increase their knowledge more than those who don’t, or whether savings from reduced turnover outweigh associated costs of the program. Your leadership will always be interested in the cost and proven outcomes of your career development programs and if you can tie a monetary value to them, those programs will be considered all the more valuable. You may be thinking, “This all sounds fantastic.” And it is! But this process isn’t easy. There are many needs to serve and it’s not simple to provide employees with the programs and tools that are necessary. That’s why we encourage the use of self-driven, employee development programs that help people take advantage of job shadowing, networking, mentoring, and other experiential activities that involve other people. Yes, these can happen without official programs run by the human resources team. But when companies take them on and drive excitement about it throughout the company, the results are far greater. Consider leveraging technology to make offering career development programs scalable and cost-effective. Chronus Software enables organizations to offer self-serve development programs like mentoring that are low on administrative cost. But here’s our key piece of advice for your employee development programs: don’t forget that this process should feel win-win for both the company and the employee. Otherwise, neither side will want to fulfill their end of the process. 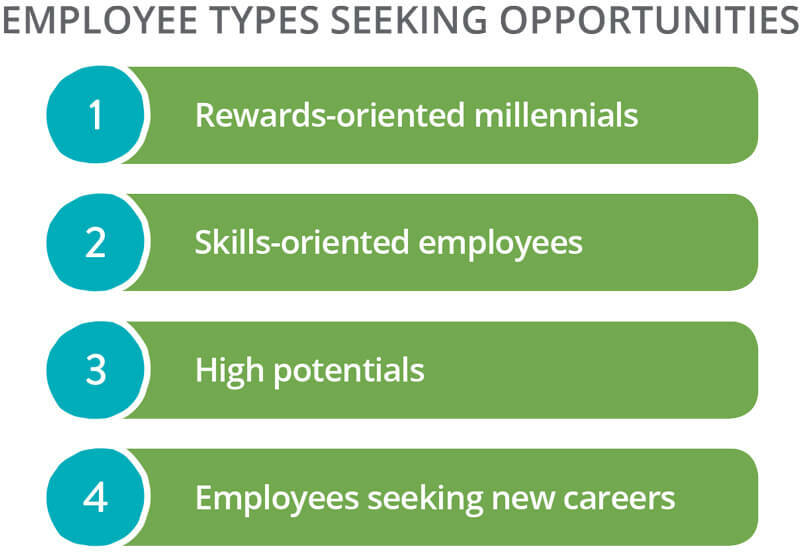 In today’s modern workforce, companies have to look for a new way to engage their employees. Employees want more than just to be promoted to the next level. They’re looking for continual learning and continued opportunities. So shift the focus to creating employee development programs that allows employees to drive their career development. Do this well, and it’ll lead to happy, engaged employees who want to do the best for your company – because it means they’re doing the best for their own careers as well. Mentoring software enables you to create a cloud-based program that is easy to use, complete with guided workflows for participants. Plus, for program administrators, mentoring software includes an automated toolset to attract, enroll, connect and guide participants, saving significant administrator time and cost. Finally, software provides measurement tools to ensure your program provides effective learning that you can measure to produce return on investment (ROI) metrics for your program.